Tesla’s giant Australian energy storage facility may seem small in the near future. Pacific Gas and Electric has submitted proposals for four new energy storage projects to the California Public Utilities Commission, one of which is for a facility at its Moss Landing substation that could output 182.5MW over the course of four hours — that’s more than 3,000 of Tesla’s Powerpack 2 units. For context, the Australian location outputs ‘just’ 129MW. The project would have a total 1.1GWh capacity, which fits with Elon Musk’s recent hints that Tesla could have a “gigawatt-hour scale” deal within months. The batteries would, as elsewhere, help keep up with “local capacity requirements” by supplying electricity at moments when power plants aren’t enough to meet demand. Provided the CPUC approves the projects, they’d be ready between late 2019 and late 2020. It might be a daunting feat to launch a storage battery system this large. Tesla’s Gigafactory has already been blamed for a worldwide battery shortage, and it won’t help matters if the company is producing even more Powerpacks on top of the batteries needed for its rapidly growing EV production. 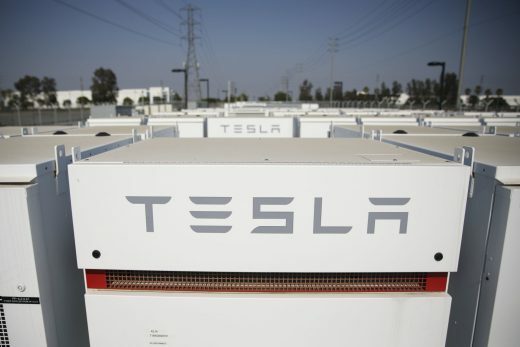 Should Tesla pull this off, though, it could both clinch more business and make a better case for storage batteries attached to major electrical grids.